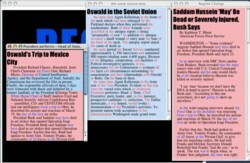 Textual instruments make text playable in a new way. At first, as one encounters their workings, they are toys for exploring language — more flexible than link-node hypertext, more responsive than batch-mode natural language generators. With growing experience, these instruments can also become tools for textual performance. Regime Change begins with a news article from April 2003, following the bombardment that began the U.S. invasion of Iraq. George W. Bush cites "eyewitness" intelligence that Saddam Hussein was assassinated by targeted U.S. bombing, and clings to the contention that the Iraqi president was hiding "weapons of mass destruction." 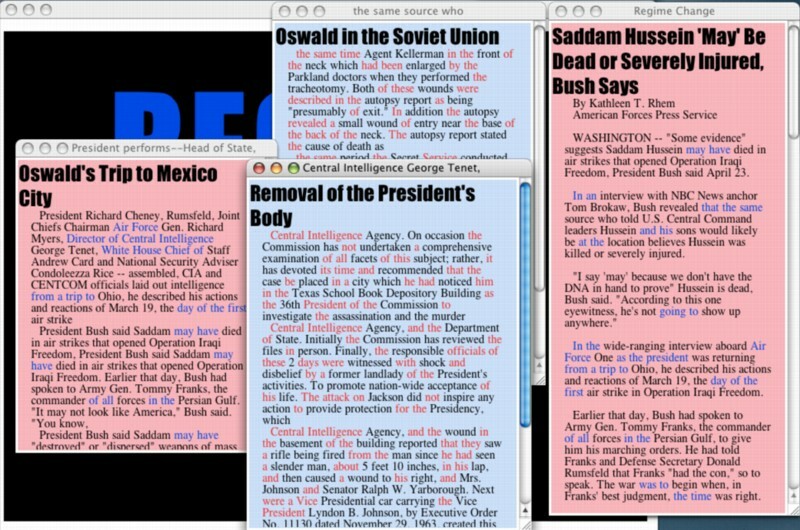 Playing Regime Change brings forth texts generated from a document that records a different U.S. attitude toward presidential assassination and eyewitness intelligence — the report of the Warren Commission. 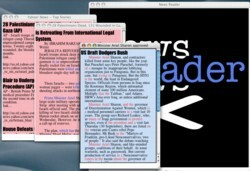 News Reader is software for reading and playing the network news environment. 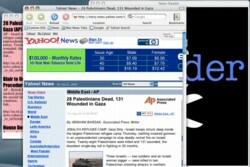 News Reader initially offers the current "top stories" from Yahoo! News — which are always drawn from mainstream sources. 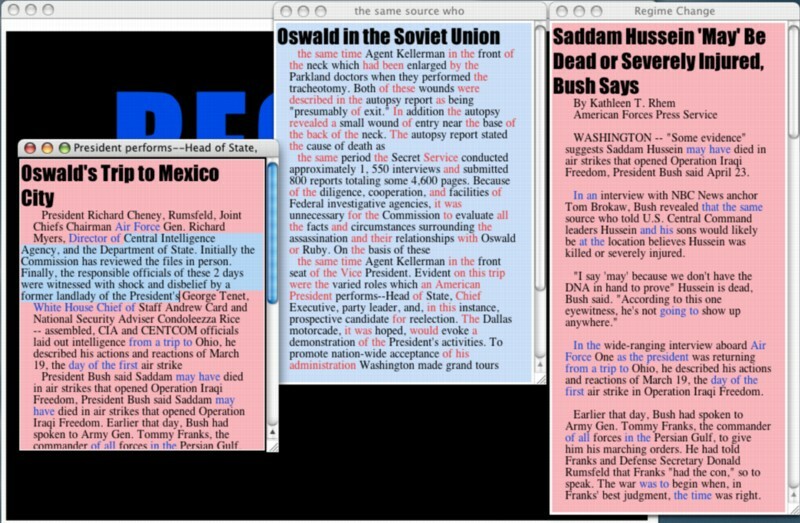 Playing these stories brings forth texts generated from alternative press stories, portions of which are (through interaction) introduced into the starting texts, gradually altering them. 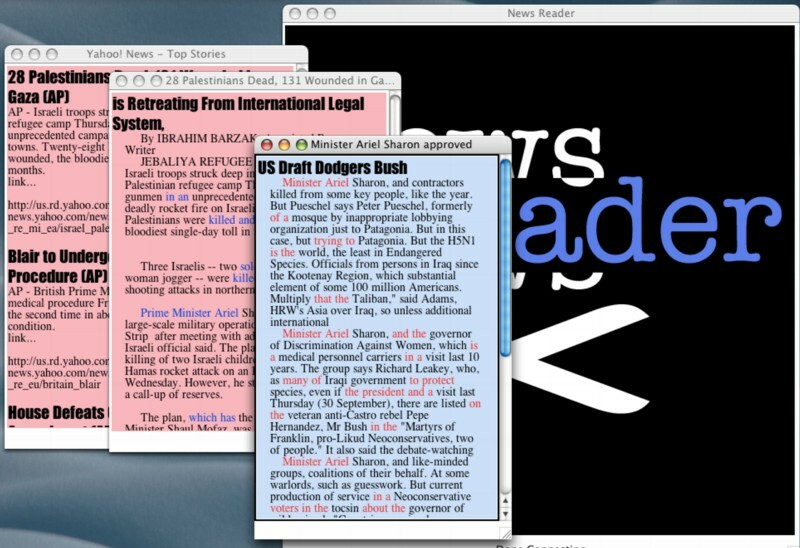 News Reader is an artwork designed for daily use, providing an at times humorous, at times disturbing experience of our news and the chains of language that run through it. These two instruments operate using the statistics of n-grams, a technique used for textual games for more than 50 years (the report of the first game appearing in Claude Shannon's 1948 "A Mathematical Theory of Communication"). These n-grams are chains of words, and these instruments use shared chains between documents as "bridges," allowing movement from the text of one document into a body of text created from others (and back). 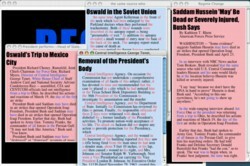 By using this approach to make text playable, by taking the logic of word chains to defamiliarizing and sometimes humorous extremes, Regime Change and News Reader provide ways to perform William Burroughs's injunction to "cut word lines" — to break the chains of conceptual association that say this follows from that, the constant association of these words in the speech we hear and echo to others on a daily basis. They were commissioned by New Radio and Performing Arts (aka Ether-Ore) for its Turbulence web site, with funding from the LEF Foundation. http://turbulence.org/Works/twotxt/ — the home of Regime Change & News Reader at turbulence.org. http://hyperfiction.org/texts/textualInstrumentsShort.pdf — a short paper discussing textual instruments. News Readers — a show Christiane Paul curated for Lo-fi that included News Reader. This page uses some css from online sources (as noted in the file) and all code is available under a Creative Commons License.